I’m excited to be going to New York next week, after what I anticipate will be a wonderful Chicago evening with Illinois Attorney General Lisa Madigan and Frances Beinecke, President of the Natural Resources Defense Council, discussing women’s political leadership. That free event is Tuesday, September 17th at 6PM at the Harold Washington Library. Thanks very much to my colleagues at the NRDC Action Fund for sponsoring. 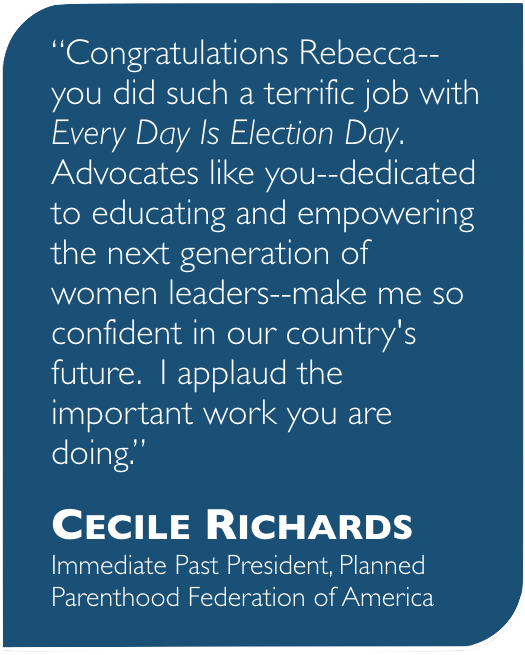 It’s off to the Big Apple the next morning, where I will join Anne Roosevelt, head of the Roosevelt Institute, (570 Lexington Ave.), for a talk and book signing for #everydayiselectionday. That event is 6-8PM and also free. To RSVP (your friends are invited, too), write to: events@rooseveltinstitute.org. And, then, a first for me: a photo shoot (with bsmart)! Best wishes this beautiful September day.